Whitewater River Rafting with Psycho Killer - What Fun ! 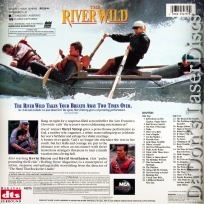 The River Wild 1994 - 112 min. 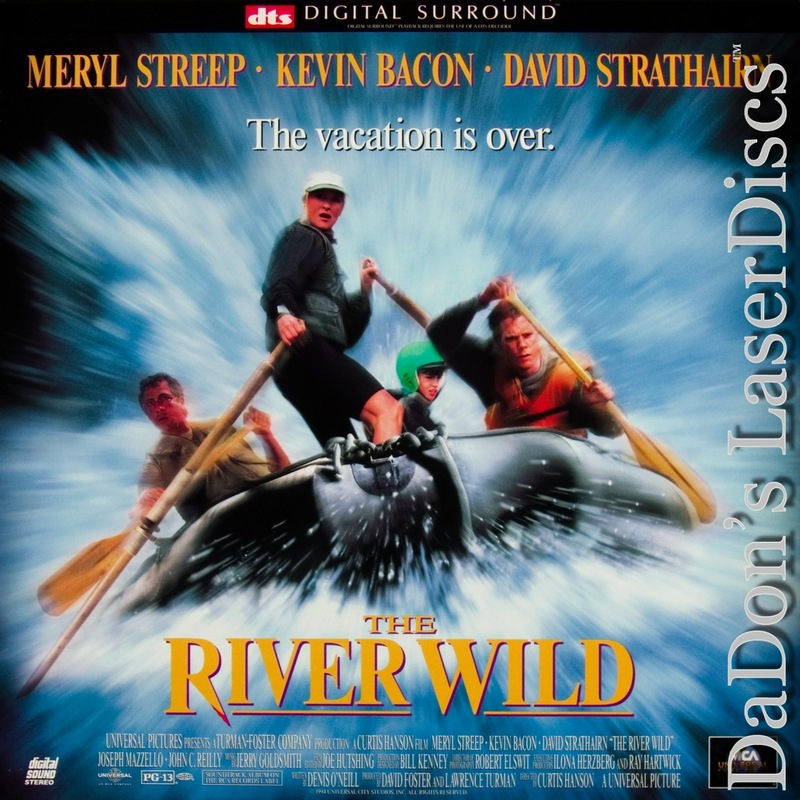 - Color Genre: Thriller Rated PG-13 Country: USA LaserDisc Movie Storyline: In THE RIVER WILD, Gail (Meryl Streep), a former river guide, plans a white-water rafting trip to celebrate her son Roarke's (Joseph Mazzello) birthday and patch up her troubled marriage to her workaholic husband, Tom (David Strathairn). 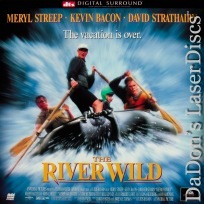 As the family begins their river adventure, they meet Wade (Kevin Bacon), a novice rafter with a magnetic personality. When the family finds Wade and his friend, Terry (John C. Reilly), stranded and abandoned by their guide, Gail and Tom decide to help them navigate the rapids. However, family fun turns to terror when Wade and Terry show their true colors--they're really criminals trying to evade the police following a major heist. To make matters worse, their escape route requires that they run the Gauntlet, deadly rapids where three rivers converge in violently tumultuous waters. This taut thriller from director Curtis Hanson (BAD INFLUENCE, L.A. CONFIDENTIAL) features Streep in her first role as an action-adventure heroine, while Bacon is truly menacing as the psychotic Wade, a desperate criminal in over his head. 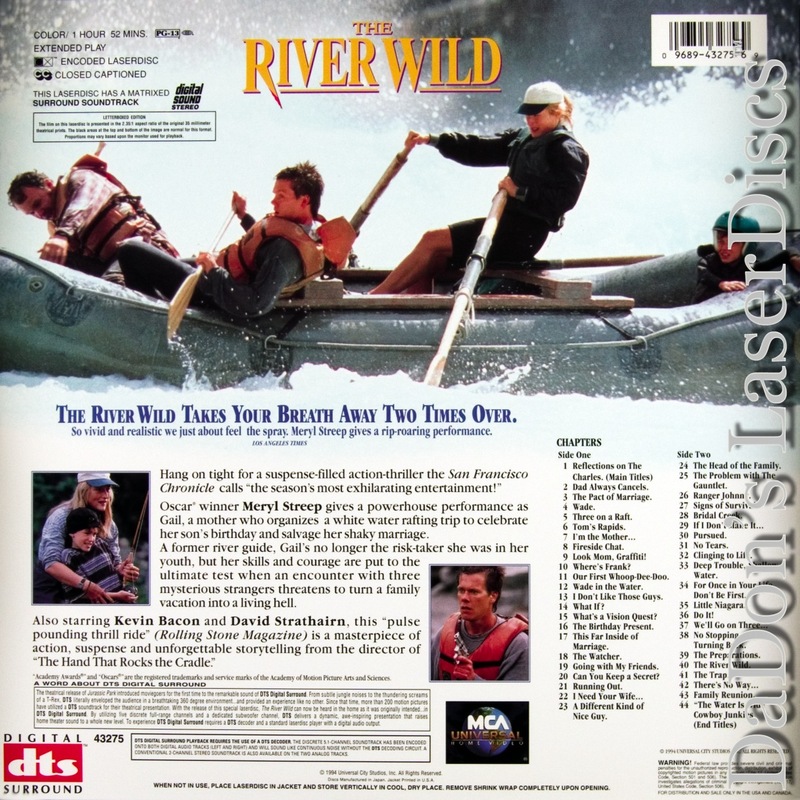 LaserDisc Movie Review: In a change-of-pace role designed to prove that she could carry high-concept genre films as well as character-driven dramas, Meryl Streep headlined this fast-paced adventure as Gail, a whitewater rafting guide. For a vacation, Gail is accompanying her son Roarke (Joseph Mazzello) and workaholic husband Tom (David Strathairn) on a river trip. Gail and Tom are experiencing marital troubles and contemplating divorce, but their problems take a back seat when they encounter some menacing rafters led by Wade (Kevin Bacon). After Tom saves Wade from drowning, they discover that the men are murderous fugitives using the river as an escape route. Kidnapped by the killers, Gail's forced to leave her husband stranded on shore and guide the villains through the "Gauntlet," a raging confluence of rivers that few rafters ever survive. Meanwhile, Tom proves to be wilier than anyone suspected, following the raft on foot and plotting his family's rescue. Following a quartet of popular B-grade thrillers, director Curtis Hanson attempted to break partially out of the genre with The River Wild, which, despite the presence of a psycho killer, played as more a stunt-filled action movie than a murder mystery. Karl Williams While the "vacationing family in peril" is not a new construct, director Curtis Hanson, in one of his pre-L.A. Confidential genre films, brings a fresh and palpable fear to the scenario in The River Wild. Due to the believable performances led by Meryl Streep in a departure and the wolfish Kevin Bacon in his familiar sheep's clothing the film crackles with a sense of normalcy spinning out of control. In less skillful hands, the good deed of picking up stranded boaters along a rocky river would have been saturated with doom from minute one as well as the certainty that the heroes would emerge unscathed. Hanson paints the set-up more in shades of gray, leaving the menacing behavior more of a surprise (even when the audience knows it's coming), and the outcome of tense moments not nearly so easy to telegraph. As the emasculated father, David Strathairn hits just the right pitch of nervous desperation. One might criticize the film for borrowing too heavily from another rafting adventure gone awry, Deliverance including a noticeable parallel between the off-boat survival instincts of Strathairn and Deliverance's Jon Voight. But Hanson and Streep provide the credibility to elevate The River Wild beyond the level of mere knock-off. Derek Armstrong Thanks for Visiting DaDon's Rare LaserDiscs ! Reviews, Articles, Newsletter and Information for Movies on LaserDisc LD Laser Disc, LazerDisc.